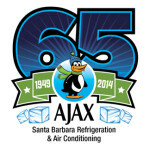 Happy 65th AJAX/SB Refrigeration and clients! 2014 marks the 65th year that AJAX/SB Refrigeration has been in business! Another way to put it is that you, our clients, have been doing business with AJAX/SB Refrigeration all these years! Thank you so much to all of you!! We could not have done it without you!